Here's my latest discovery among beetroot recipes. I was browsing Sam and Sam Clark's latest book, MORO EAST, and this Persian dish caught my eye. 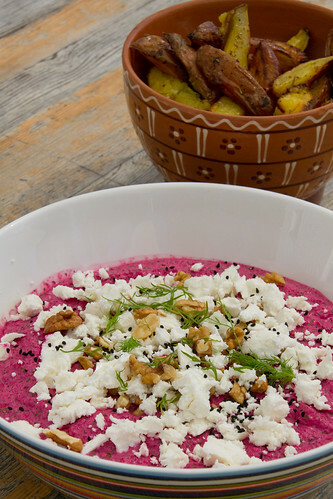 Borani is a general term for yogurt-based vegetable "salads" and dips in Persian cuisine. We really enjoyed this, eating it with simple oven-baked potato wedges on our sunny patio. It'd work well on a meze/mezze board with some toasted flatbread, or alongside some grilled or fried fish, oven-roasted lamb or even grilled chicken. It's extremely versatile, as you can imagine. I will surely be making this borani chogondar again over the summer (I loved the colour!!! ), perhaps alongside the spinach version (borani esfanaaj) and the aubergine/eggplant version (borani bademjan). Make it at least a few hours in advance, so the flavours can develop. 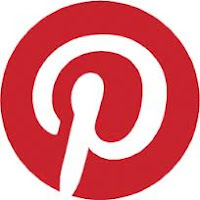 If you're a fellow beet lover, you may want to check out the Beautiful Beet Recipes Pinterest board, where you'll find 100+ great pins leading you to some wonderful foodbloggers' recipes. If you'd love to contribute to that board, then just leave your Pinterest handle in the comments and I'll send you an invite! Scrub the beets, but don't peel them. Place into a boiling water and simmer for 1-1,5 hours, until cooked. Drain and cool and peel, then cut into chunks and place into a food processor. (Note that you can also roast the beets, or, in a hurry, use boiled un-vinegared beets). Process the beets, then add the yogurt, crushed garlic and a pinch of sugar, process again until smooth. Add the chopped dill, then season to taste with salt, pepper and vinegar/lemon juice. Transfer onto a serving bowl, cover with clingfilm and put into the fridge for a few hours so the flavours can mingle. 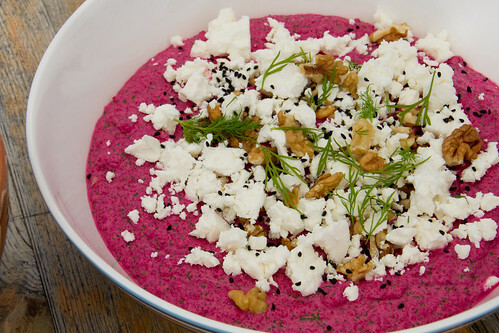 When ready to serve, garnish with crumbled feta, chopped walnuts and some dill fronds. Sprinkle black nigella seeds on top. Very pretty, Pille! 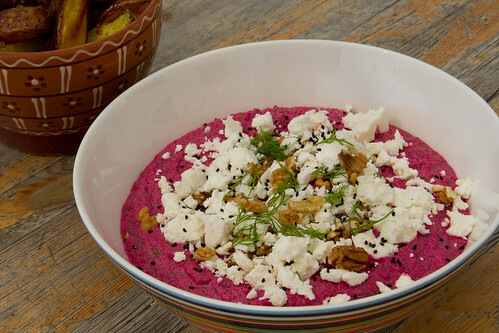 Could you make a non-dairy/vegan version by substituting chickpeas for the yoghurt & leave off the feta cheese garnish? Thank you, Roxy!! I bet you'd love this! Beet princess, this looks beautiful!